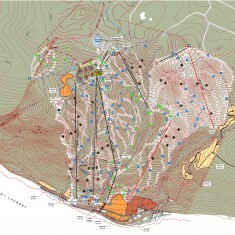 Le Massif de Charlevoix | Le Massif de Charlevoix | Ecosign Mountain Resort Planners Ltd. The ski facility has two staging portals; one at the summit and one at the base. The largest staging area is at the top of the mountain at 716 meters elevation, with the largest parking lot and the main day lodge. A smaller base area with parking and a lodge is located at the bottom of the ski trails, at the 54-meter elevation. The skiing vertical is approximately 750 meters from the highest ski lift, which is the largest vertical drop in Eastern Canada. 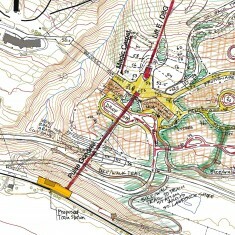 In December 2009, Ecosign prepared a Ski Area Master Plan for the resort. In the final phase of development a total of twenty existing and proposed lifts will accommodate a skier carrying capacity of 11,550 skiers per day. In a press release of March 2010, Groupe Le Massif announced a $16 million mountain investment integrated into its tourism and recreation project including a new 8 passenger gondola with angle station, four new trails, a novice sector with two lifts as well as the expansion of an off-piste sector. Construction was completed for a December 2010 opening. The summit of Le Massif is the most used access point for skiers from the direction of Quebec City, the main skier market for Le Massif. Detailed planning for a parking lot expansion and for skiing and teaching facilities for baginners and children was completed for the Summit area, including general location and programming for a new Learning Centre, three moving carpets and two platter lifts. 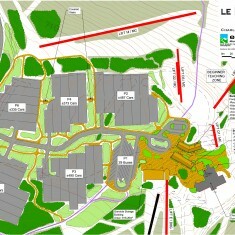 Detailed grading plans for lift location and beginner area ski terrain were included.